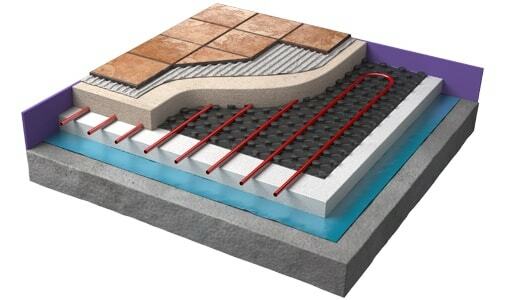 The Warmup Nexxa Panel System enables the most precise installation of underfloor heating within a floating screeded floor. 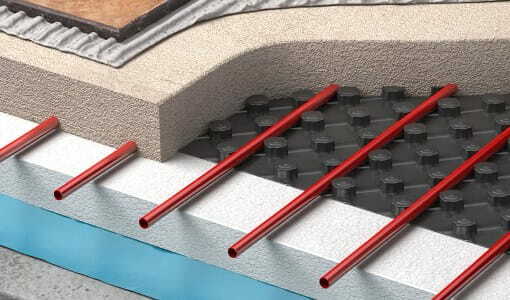 The Nexxa Panel System uses unique castellation panels in which to securely locate and hold the heating pipes in place. The system is suitable for new-builds and renovations but is used primarily where there are floor build-up issues to deal with. The panels require less screeding than other systems – meaning it can substantially reduce the overall build-up of the floor structure. Insulated is designed for refurbishments with low build-up of floors and un-insulated is suitable for all types of insulation, particularly where pre-existing floors are in place. Interlocking the pipe, no clips are used in the installation and the system is laid as per the approved design. Holds the pipe at the correct level prior to screeding to ensure there are no hot spots. System plates are formed of interlocking vacuum formed sheets of plastic, incorporating pipe-locating castellation’s. These sheets, or panels, are laid over the subfloor and are thermally insulated in accordance with Building Regulations. The edges are overlapped by 75mm, interlocking them to form a continuous layer. The castellated board can be insulated or supplied purely as a way to install the pipework. The system can utilise any of Warmup’s 16mm heating pipes and holds the pipework in place until the screed is applied. UltraTile from Instarmac provides one of the best screeds on the market for this purpose. The Nexxa Panel System is a suitable system for almost any floor finish and in particular where the flooring (wood, carpet or vinyl) may be replaced from time to time.